Finally back to bento again!! I missed all blogger friends during the holiday. But now, everybody seems to be back again on posting the fabulous bento and cooking. I was supposed to be back to Jakarta on 16 January, 2010 but I decided to come back earlier since I missed home so much and my sister's twins would still be staying at the hospital until end of January / early February. The kids were back to the school this morning after the Christmas holiday. My hands trembled a lot when preparing today's bento hahaha ... For regular Monday's bento, I chose quick and simple one. I made chicken noodle, quick to prepare for busy Monday morning. This time I used green noodle (green --> spinach), unfortunately the green color was not really clear in the picture but I swear it was green. Inside the box were : beef meet ball, choy sum & been sprouts, wonton, char siu, and champion mushroom. I made some decorations from fish ball (small flower shapes) and from cherry tomatoes (tiny tomato's head). a beautiful start to the week! love these cute tomato faces, and the green noodles look yummy too. wonderful to have you back in the bento groove! I too have missed your bentos. Welcome back Lia! 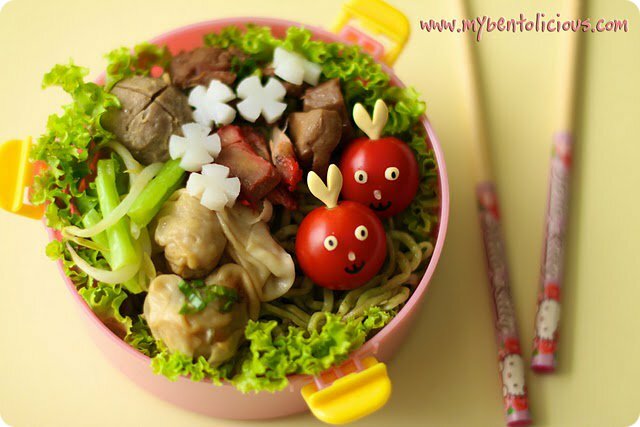 You know, by the looks of this verycute bento... you haven't lost your touch! Very nice! I was in Jakarta for a few weeks on business in 1990. Had a great time and really enjoyed a visit to a "zoo" (not quite the right term) where we drove through places with various animals out. I have a great picture of an ostrich with his head in our car window and another of me sitting with a (drugged I'm sure) tiger. @Ellen : Thanks for visiting my blog Ellen! I am sure that is called 'Taman Safari'? You have a great food blog, love it! btw, how about your sister and the twins? Finally you are back, I have missed your bento sooooo much. Happy to see your blog in the 1st place of my blog list, it means u r back to bento life (^_^). The bento is awesome, the tomatoes are so detail although after long break. And great start with this nice bento ^-^ I love how the tomatoes look. So cute! yay, glad to see ya back in action. the little cherry tomato heads are sooo cute! what did u use to make the mouth? Adorable! I love the tomato faces they are so cute! Pretty fancy for a simple bento! Hi Lia Chen, Welcome back! Really missed your bentos posting. Keep Going!! welcome back Lia! looking forward to your bento in the new year. Welcome back, Lia!! Great way to get back to bento, with this beautiful and detailed one--the tomato faces are so cool! Wishing you an abundant and very happy year, and looking forward to all your amazing new productions! @Jenn : Thanks a lot for your nice supporting comment Jenn! @bentobird : It's great to see your bento again too. Thanks for always support me with your nice comment Jenn!